Speaker: Gary Seloff is an IT Manager at NASA/JSC with three decades of experience in imagery collection management and IT. For the past 10 years or so, he has been kayaking and taking photographs on Armand Bayou, Horsepen Bayou, Mud Lake, as well as on site at JSC and nearby areas. Presentation: Wildlife on the campus of NASA/JSC includes bobcats, alligators, coyotes, snakes, lizards, and many kinds of birds, including herons, egrets, woodpeckers, owls, flycatchers, cardinals, mockingbirds, bluejays, sparrows, doves, bald eagles, and ospreys. Links: Here is a link to the photographs of Mr. Gary Seloff on Flickr, where he published more than 10,000 photographs and he has more that 10,000 followers. A free membership might be required to see the photographs. Here is a link to the one-page PDF publicity flyer we used. Attendance was about 24 people. [2016 10 04, October 4, 2016, Sputnik launch date anniversary] [Published here October 1, 2016] Lunch & Learn featuring invited guest speaker James Oberg, Soyuz TMA-19M Launch & Ascent Observations from ISS and Ground & Airborne Observers (Launch: December 15, 2015). Here is a link to the PDF version of the JPEG image below. Here is a link for this article of October 4, 2016. [2016 04 22, April 22, 2016] [Published here March 13, 2016, updated April 18, 2016 and April 24, 2016] Lunch & Learn Friday, April 22, 2016. Please see the image below (click to zoom). The EventBrite web page link for publicity was excellent as always. As of April 18, 2016, we have 21 attendees on our list, with 12 meals pre-ordered. The BBQ (barbecue) meal was excellent, as always, thanks to Red River BBQ and Red River Catering. I believe I forgot to order the iced tea, but we had no other troubles. Attendance was 24 (pre-event online registration, with 12 meals pre-ordered), including our invited speaker and our event host. Charts from our invited speaker, Dr. Albert A. Jackson IV: Link for a PDF file (3.5 MB), link for a PowerPoint file (the original file, 24.4 MB, 26 slides), and a link for a Keynote file (9.4 MB). Presentation: Eugen Sänger, from the Silverbird to Interstellar Voyages. [2017 12 2] Published here December 3, 2017. 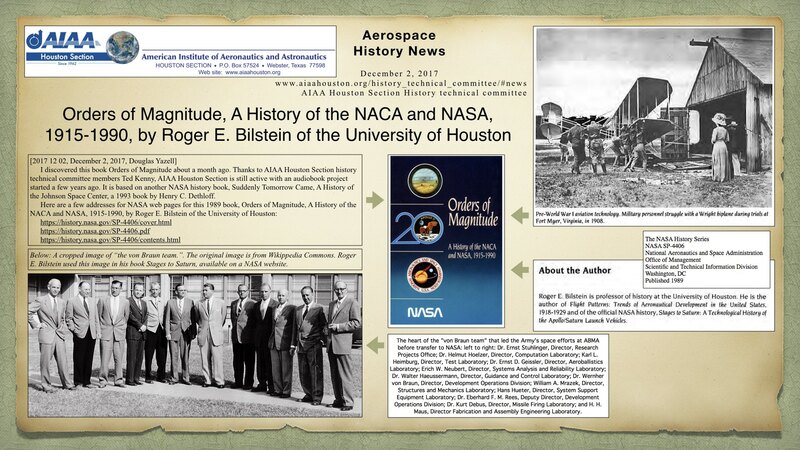 Order of Magnitude, A History of the NACA and NASA, 1915-1990, a 1989 NASA History Series book by Roger E. Bilstein of the University of Houston. Here is a link to the PDF version of the JPEG image below. [2017 11 26] Published here November 26, 2017. 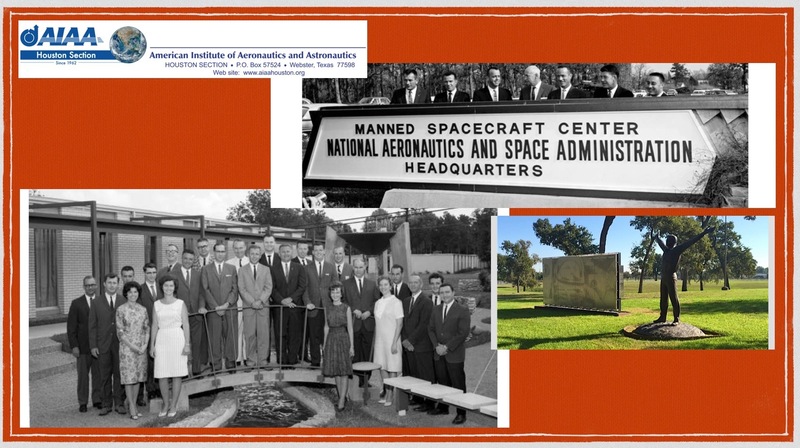 The 2012 video greeting from Dr. George Nield on the occasion of the 50th anniversary celebration of AIAA Houston Section. This 30-second (4 MB) video file is a great souvenir whose file information dates it as June 6, 2017. 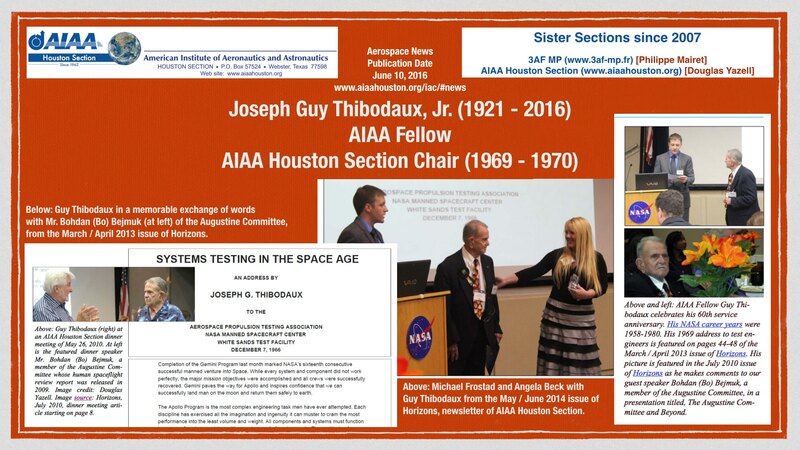 As he mentions in this video recording, he served twice in the role of Chair of AIAA Houston Section. Since our Section started in 1962, only Dr. Nield served twice in that role. Here is the link to that file. [2017 07 15] Published here July 15, 2017. The 1940 Air Terminal Museum at Hobby Airport, an AIAA Historic Aerospace Site. Recent & Upcoming Events. Here is a link to the PDF version of the JPEG image below. [2017 06 28] Published here June 28, 2017. 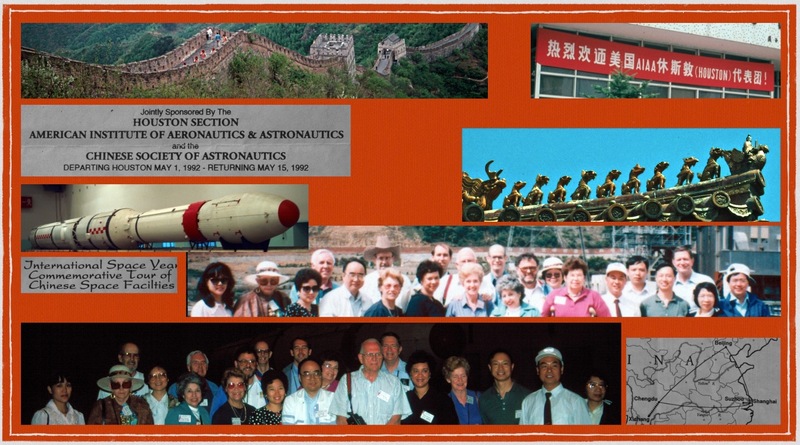 A 3-minute video featuring the history of Horizons, newsletter of AIAA Houston Section. This provides a better history lesson than I (Douglas Yazell) remembered. Shen Ge and I created this video (and this YouTube channel for AIAA Houston Section) for a 2012 Kickstarter crowdfunding campaign for Horizons: https://www.youtube.com/watch?v=E8NSex0RhAk. [2017 06 28] Published here June 28, 2017. A few links of interest to our history technical committee were emailed to us recently from Philippe Mairet of our French sister section 3AF MP. From Air & Cosmos, June 27, 2017, Il y a 40 ans disparaissait Wernher von Braun, 40 Years Since the Death of Wernher von Braun. [In French] http://www.air-cosmos.com/il-y-a-40-ans-disparaissait-wernher-von-braun-96943. From the French website Capcom Espace (in French), a web page about the history of NASA Johnson Space Center, https://www.capcomespace.net/dossiers/espace_US/apollo/installations/centre_MSC.htm. [2017 06 24] Published here June 24, 2017. 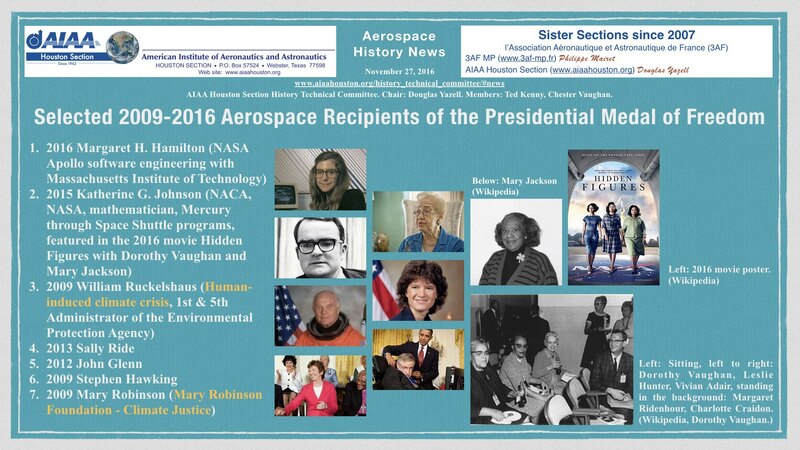 John B. Charles publicized this event in JSC Today (email news for NASA/JSC civil servants): Honoring First African-American Astronaut Trainee. 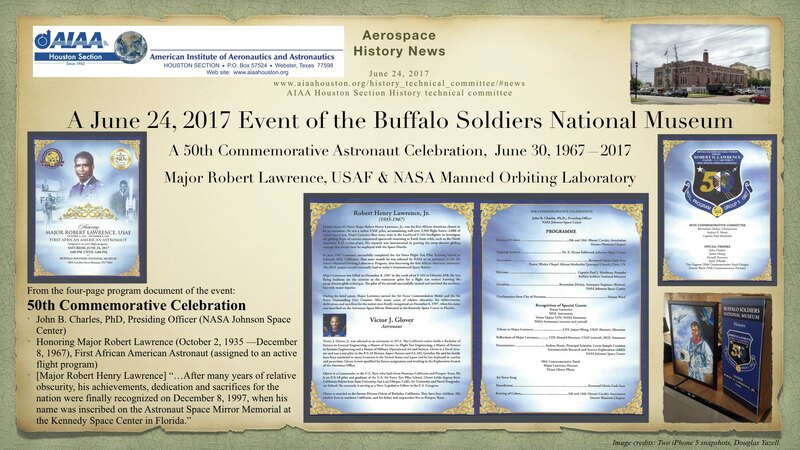 The event will recognize Major Robert H. Lawrence, United States Air Force (USAF), on the 50th anniversary of his selection as the first African-American astronaut trainee on June 30, 1967. Lawrence was in the third group of pilots selected for the USAF Manned Orbiting Laboratory (MOL) program, a secret piloted reconnaissance platform in low-Earth orbit. That program was cancelled in June 1969. Tragically, he died in the crash of a training jet aircraft in December 1967; but, had he survived, Major Lawrence would almost certainly have been transferred to NASA in August 1969, along with seven other MOL pilots who flew the early shuttle missions and later led NASA. Local elected officials, NASA astronauts current and past and others will offer tributes to Maj. Lawrence. In addition, a new portrait of Major Robert H. Lawrence will be unveiled. Event Date: Saturday, June 24, 2017 Event Start Time:2:00 PM Event End Time:5:00 PM. Event Location: Buffalo Soldiers National Museum, 3816 Caroline Street. [No PDF version of the JPEG image below is provided, since the only links are in the website of AIAA Houston Section, www.aiaahouston.org.] We have some event photos from Douglas Yazell (iPhone 5 camera) and Michael Oelke (Canon DSLR camera). 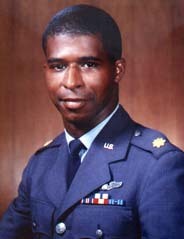 Above: Major Robert Henry Lawrence Jr. (1935-1967). Source: Wikipedia. [2017 05 29] Published here May 29, 2017. 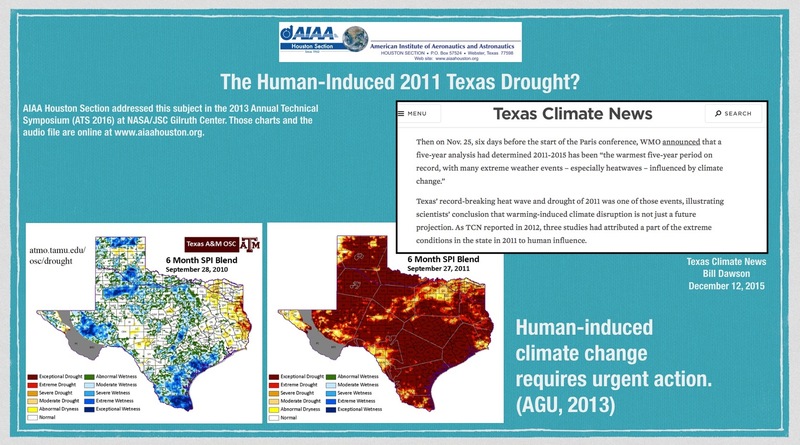 Two Recent Climate Change Events in the NASA/JSC Community. Here is a link to the PDF version of the JPEG image below. Dr. André Droxler, Rice University Earth, Environmental, and Planetary Science, and Rice University Baker Institute for Public Policy Scholar. Doug Peterson, Exploration Green Conservancy. Downtown Houston has an excellent park, Discovery Green. Now the NASA Johnson Space Center community has Exploration Green. A huge 1960s-era golf course has now been converted into this park. Flood control, recreation, hiking, biking, walking, environmental protection, wetlands, islands, and more. The first Clear Lake City homes were built here with the NASA/JSC community in mind. This area is now called the Houston Clear Lake area. Exploration Green: 200 acres. 80 acres of lakes, open water, wetlands, and islands. Exploration Green is open already with 20 or 30 entry points. Phase 1 of 5 will be complete in 2017. Exploration Green is divided into 5 sections. Here is a link to the PDF version of the JPEG image below. As the ATS 2017 poster below shows, Dr. Edgar Bering led the Engineers as Educators workshop from 9:00 AM to noon in the NASA/JSC Gilruth Center Lone Star Room. [2017 04 30] Published here April 30, 2017. 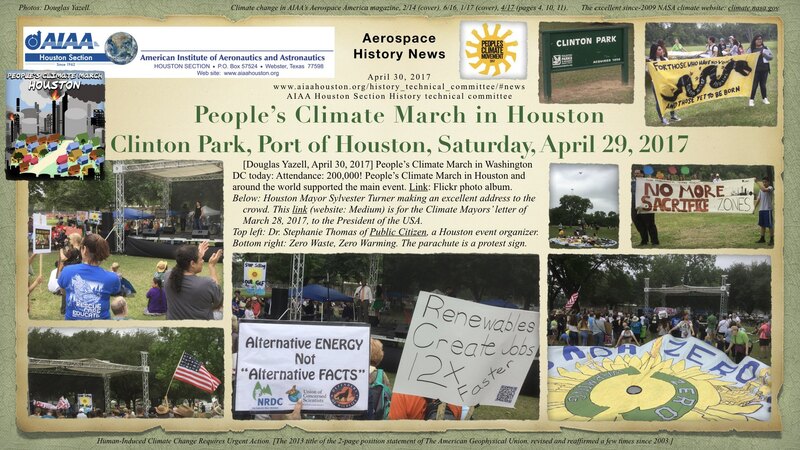 People’s Climate March in Houston, Clinton Park, Port of Houston, Saturday, April 29, 2017. Here is a link to the PDF version (6 MB) of the image file below. [2017 04 29] Published here April 29, 2017. 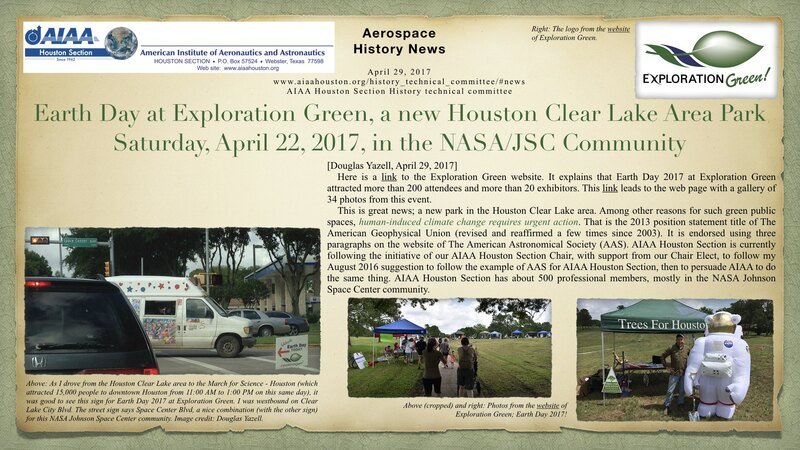 Earth Day at Exploration Green, a new Houston Clear Lake Area Park, Saturday, April 22, 2017, in the NASA/JSC Community. Here is a link to the PDF version of the JPEG image below. [2017 04 23] Published here April 23, 2017. 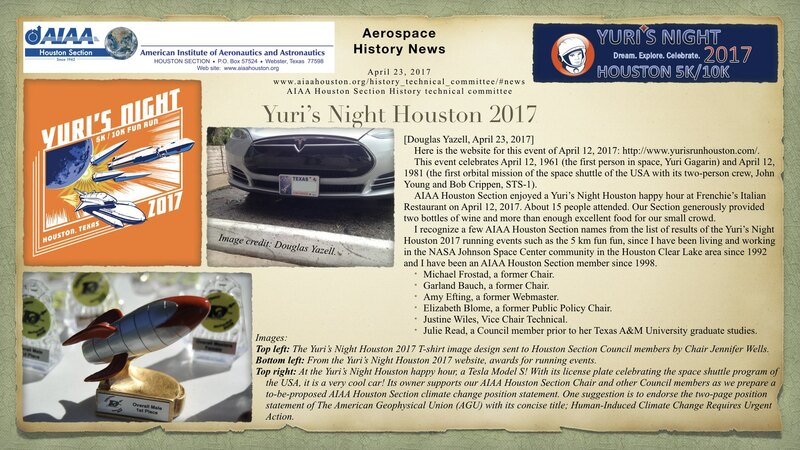 Yuri’s Night Houston 2017. Here is a link to the PDF version of the JPEG image below. [2017 04 23] Published here April 23, 2017. 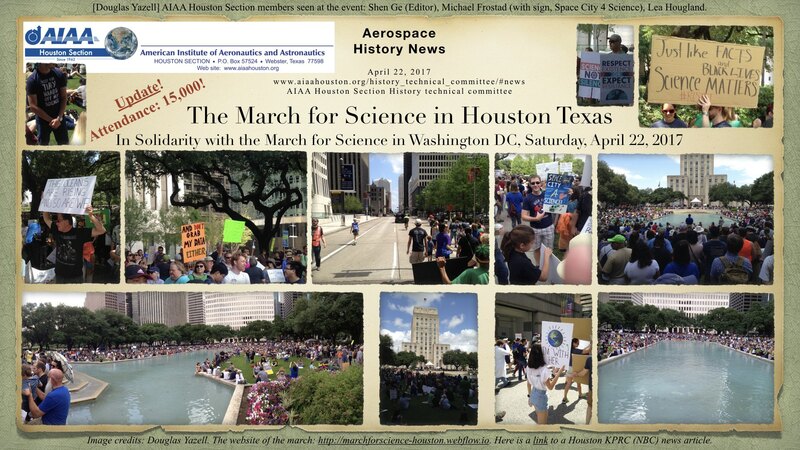 March for Science – Houston, In Solidarity with the March for Science in Washington DC, Saturday, April 22, 2017. Here is a link to the PDF version of the JPEG image below. [2017 04 16] Published here April 16, 2017. 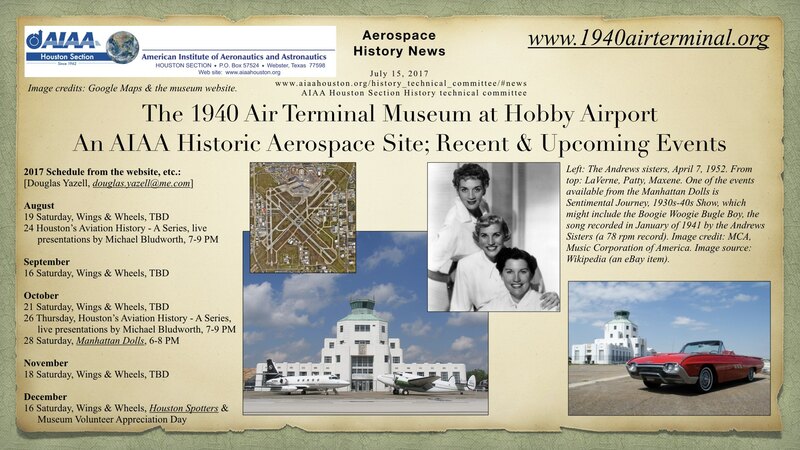 The 1940 Air Terminal Museum at Hobby Airport; An AIAA Historic Aerospace Site; Recent & Upcoming Events. Here is a link to the PDF version of the JPEG image below. [2017 03 18] Published here March 18, 2017. Please see the news article using this link or, to avoid scrolling down later, this link. Those links go to the news article published on the AIAA Houston Section International Activities Committee (IAC) web page. The title of this news article is Toulouse Nuts (the restored 1944 TF-51 Mustang) in Houston in 2017; The 2016 Oshkosh AirVenture Grand Champion. [2017 02 25] Published here February 25, 2017. Famous Figures: Carl Huss. Here is a link to the PDF version of the JPEG image below. [2017 02 22] Published here February 22, 2017. 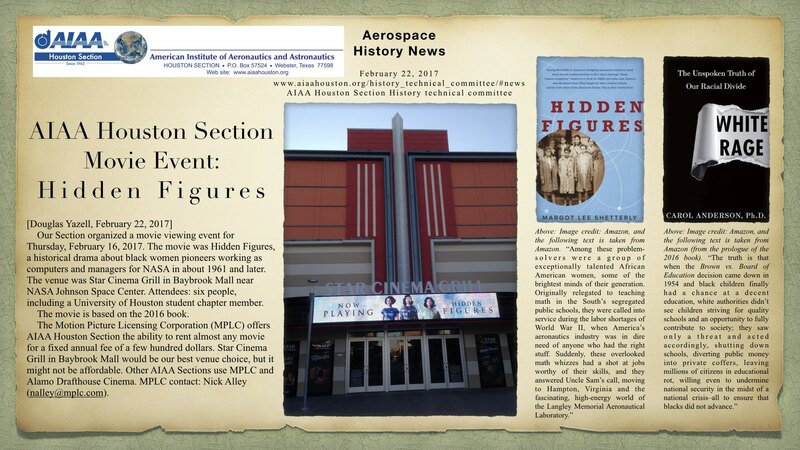 AIAA Houston Section Movie Event: Hidden Figures. Here is a link to the PDF version of the JPEG image below. [2017 02 04] Published here February 4, 2017. Congratulations to the New AIAA Region IV Associate Fellows Including Former AIAA Houston Section Chair Michael Oelke. Congratulations to new AIAA Fellow John Valasek of Texas A&M University. Here is a link to the PDF version of the JPEG image below. [2017 01 21] Published here January 21, 2017. 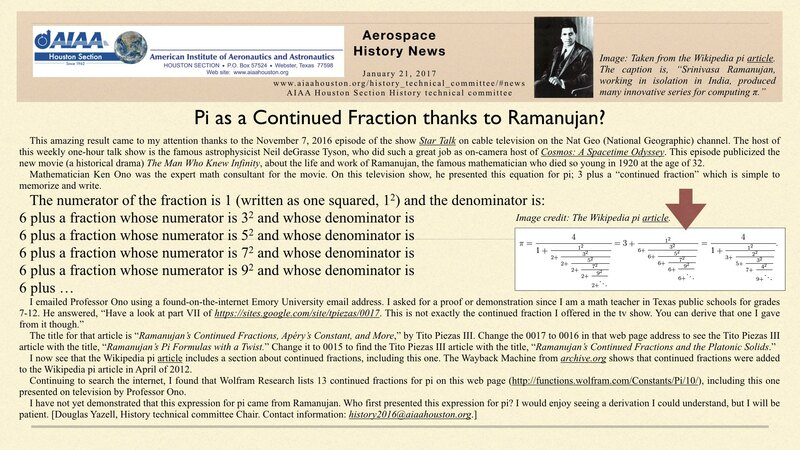 Pi as a Continued Fraction thanks to Ramanujan? Here is the link to the PDF version of the JPEG image below. [2017 01 02] Published here January 2, 2017. Affirmative Diversity: Goals & Timetables. 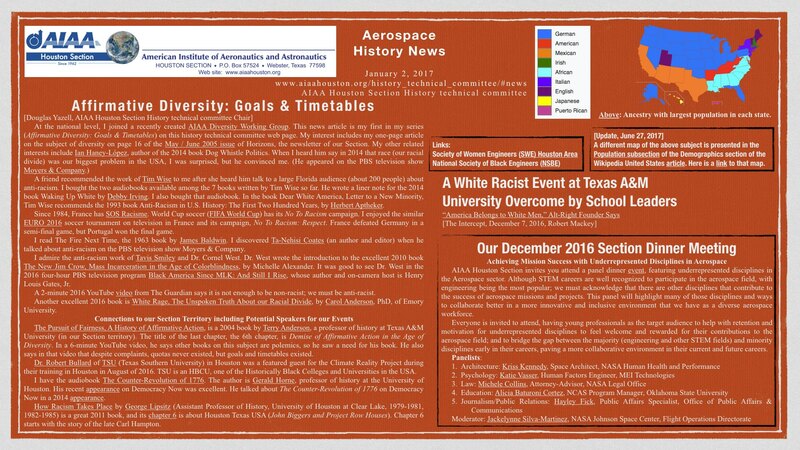 First in a series by Douglas Yazell, former AIAA Houston Section Editor (2008, 2011-2014) on the subject of diversity, inspired by the AIAA Diversity Working Group. Here is a link to the PDF version of the JPEG image below. [2016 12 18] Published here December 18, 2016. 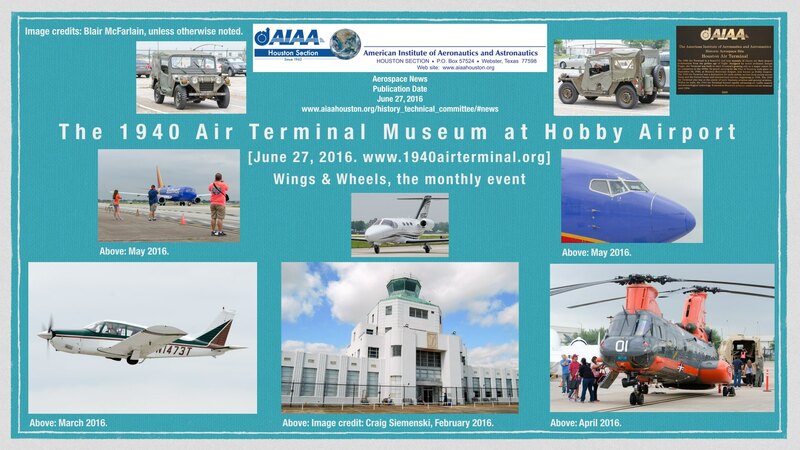 The 1940 Air Terminal Museum at Hobby Airport, Monthly Wings & Wheels Events Continued for All of 2016, A 2009 AIAA Historic Aerospace Site. Here is a link to the PDF version of the JPEG image below. [2016 12 16] Published here December 16, 2016. 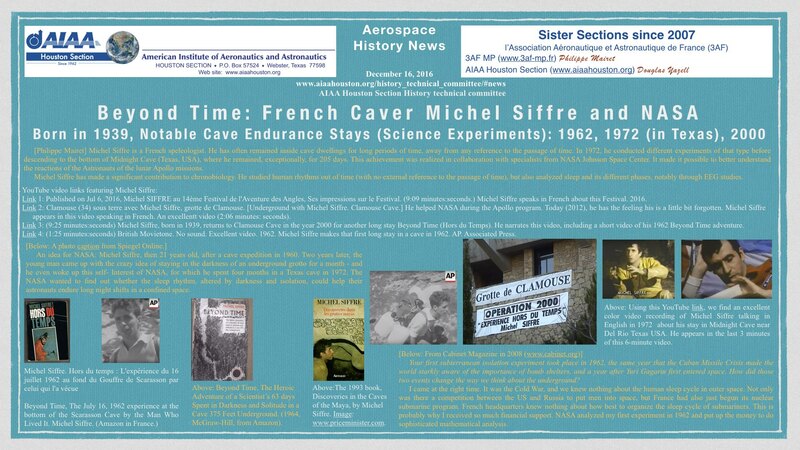 Beyond Time: French Caver Michel Siffre and NASA: Born in 1939, Notable Cave Endurance Stays (Science Experiments): 1962, 1972 (in Texas), 2000. Here is a link for the PDF version of the JPEG image below. [2016 12 12] Published here December 12, 2016. 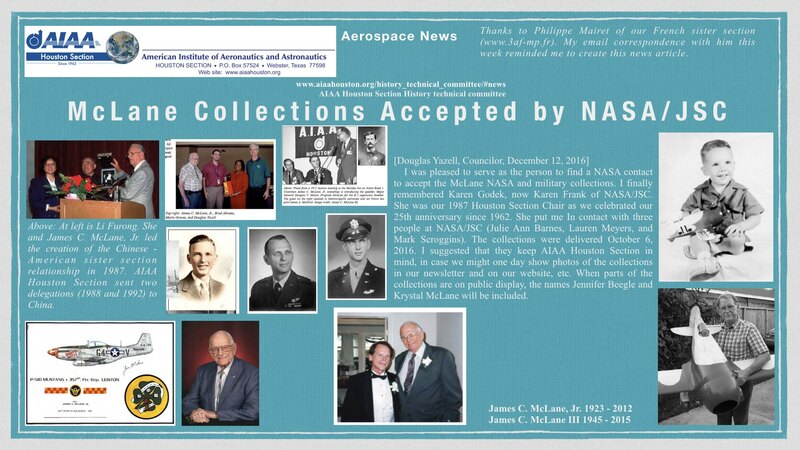 McLane Collections Accepted by NASA/JSC. Here is a link to the PDF version of the JPEG image below. [2016 11 27] Published here November 27, 2016. Selected 2009-2016 Aerospace Recipients of the Presidential Medal of Freedom. Here is a link to the PDF version of the JPEG image below. Here is a link to the PDF version of the image below. [2016 07 04] Published here July 4, 2016. 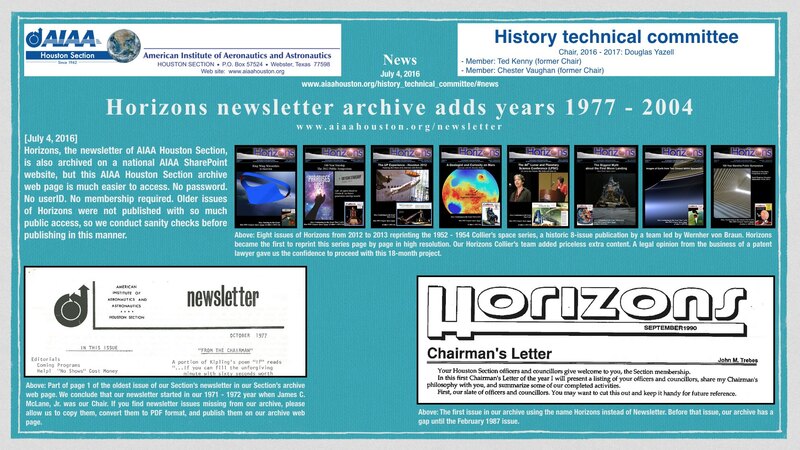 Horizons newsletter archive adds years 1977 – 2004. This AIAA Houston Section Horizons newsletter archive web page is www.aiaahouston.org/newsletter. [2016 06 27] Published here June 27, 2016. Suddenly Tomorrow Came, the Audiobook. A Ted Kenny project for AIAA Houston Section. From the 1993 book by Henry C. Dethloff, Suddenly Tomorrow Came, a History of the Johnson Space Center. The entire book and one page per chapter of artwork is already published by NASA. How can we add tables, figures, photographs, and captions? 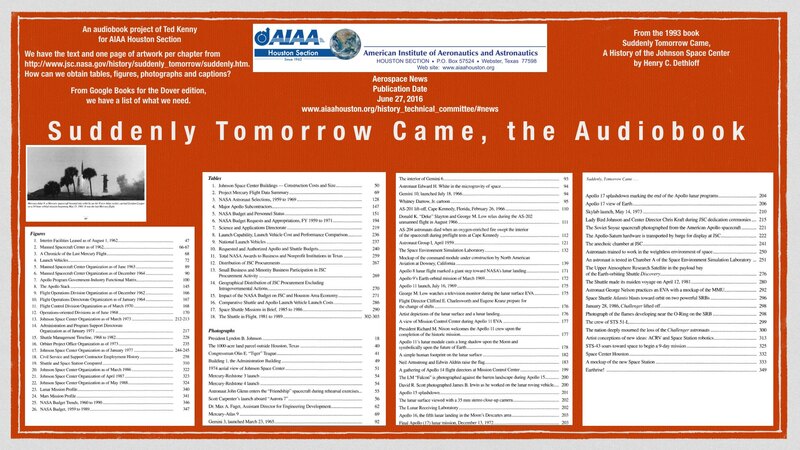 Above: Suddenly Tomorrow Came, the audiobook, a Ted Kenny project for AIAA Houston Section. [2016 06 27] Published here June 27, 2016. The 1940 Air Terminal Museum. An AIAA Historic Aerospace Site. The monthly Wings & Wheels event. Here is the link for the website of the museum. [2016 06 10] Published here June 10, 2016. Joseph Guy Thibodaux, Jr. (November 27, 1921 – April 26, 2016). An AIAA Fellow. AIAA Houston Section Chair 1969 – 1970. 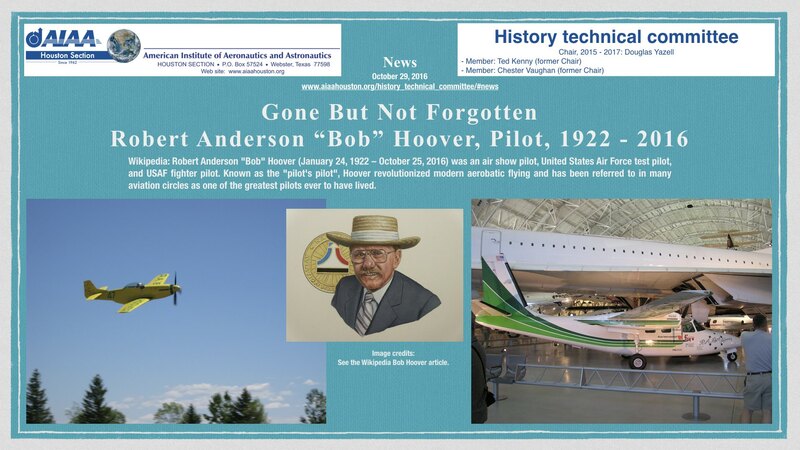 A NASA Watch article brought this sad news to us and provided two links, one link for an obituary and one link for an oral history and a biography. Glenn Jenkinson was Vice Chair Technical when Dr. Garland Bauch was our Section Chair for 2000 – 2001. Glenn supervised starting up a Propulsion technical committee for our Section led by Guy. Our newsletter Horizons will shows Guy in that role on the organization chart, for about two years starting about July 1, 2002. I (Douglas Yazell) attended the initial meeting (in a NASA/JSC building near the back gate) thanks to an invitation from Glenn. Norman Chaffee attended. Quite a few of Guy’s retired engineers attended, including Hubert (Hugh) Brasseaux, my great tennis friend from the Bay Area Racquet Club. Glenn arrived late with cookies he ordered from a grocery store. The cooks were late with that task. Astronaut Franklin Chang Diaz attended, too. For the 2003 – 2004 AIAA year, I was our Section’s Vice Chair Technical, and Guy resigned from that role as Chair of that technical committee. His many members were more interested in hunting and other hobbies once they retired. I was Vice Chair Technical for 2003-2004, so one of my jobs was being the General Chair of our Section’s Annual Technical Symposium (ATS). 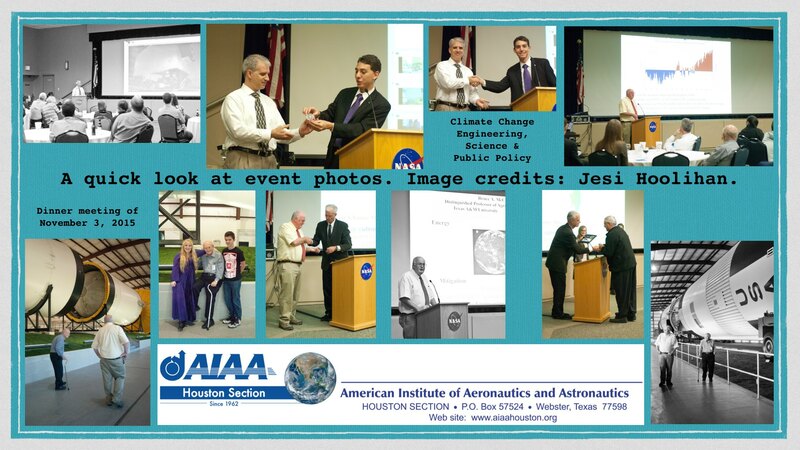 We held the event on Friday, April 16, 2004, at NASA/JSC. I called our first in-person planning meeting for Halloween day 2003, October 31, 2003. All of our meetings took place at Mediterraneo Cafe on Upper Bay Road. We met every two weeks for a while, then every week. Ellen Gillespie, Tsutsumi Sophia Bright, Murugan Subramaniam, and more. Others joined our planning group, but a big boost for me was having Norman Chaffee and Guy Thibodaux join our planning meetings. I was a clumsy leader, but I learned some things. That was my introduction to Guy. Chester Vaughan later joined our planning meetings, too. We aimed to find 54 presentations (54 presenters for our 3 concurrent sessions). Only a few weeks before the event, we needed 18 more. Ellen Gillespie at United Space Alliance found Bob Smith (? ), a manager who liked AIAA. He ordered all of his team to make presentations, so we found our last 18 presentations. That was ATS 2004. Looking back, we had no ATS the 3 years before ATS 2004, and if I counted correctly (www.aiaahouston.org/history_technical_committee), ATS 2004 was the 25th occurrence of ATS, an anniversary we did not know about at the time. The archive.org website saved related information from our former website, www.aiaa-houston.org. For example, even some presentations (PowerPoint or PDF) can still be found using this link. ATS 2 took place in 1976. We have no record for now of ATS 1. Our Section started in 1962. Horizons (our Section’s newsletter) probably started in late 1971 or early 1972, and our first archived issue is now a 1977 issue. The name Horizons was not used initially. The only other year to omit ATS was 1997, the year before Dr. George Nield was our Section Chair for a second time; only he has been Section Chair twice. Two issues of Horizons featuring Guy Thibodaux are mentioned below, so here are those two links. The first link is for the April / May 2013 issue. Here is the link for the high-resolution version of that issue. In fact, that issue refers to the mention of Guy in the July 2010 issue, too, so that link is here. That link fails to use our Horizons directory, so I should update it, but I will probably postpone that. The second link is for the May / June 2014 issue. Guy Thibodaux will be missed and never forgotten. As I told him once, probably at a 2011 NAL-JSC-hosted climate change meeting at NASA/JSC Gilruth Center, I glanced at his NASA biography and noted that he NASA Exceptional Service Medal (TWICE in 1969!). I told him that was insanely great, or something like that. He modestly replied that NASA handed out a lot of those at the time. I replied that I was so impressed that he won that medal TWICE in the year that people first walked on the Moon! Guy will be missed and and never forgotten. [2016 04 18] Published here April 18, 2016. 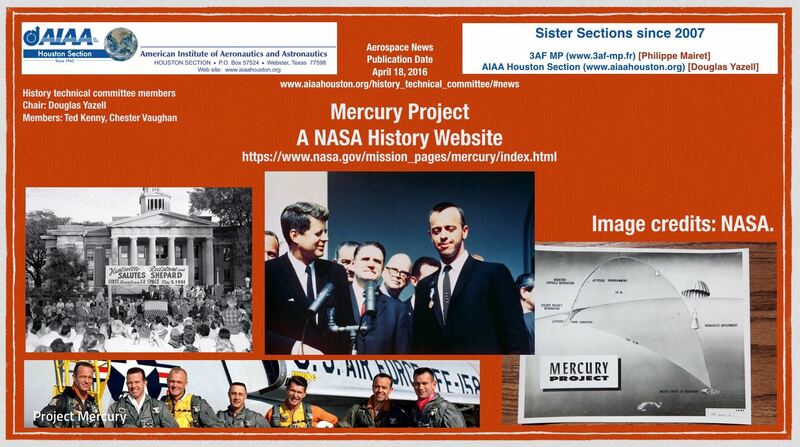 Philippe Mairet and I (Douglas Yazell) just now discovered this NASA history website for the Mercury program. The link leads to a gallery of photographs and much more. 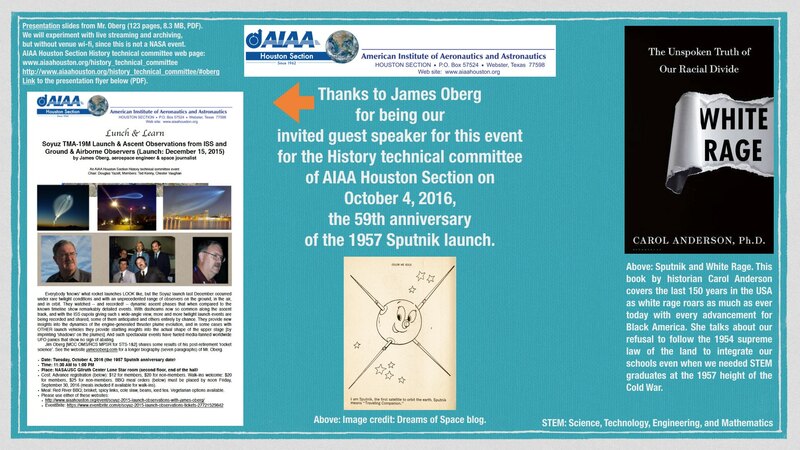 [2016 01 06] AIAA Houston Section dinner meeting of December 3, 2015. [2016 01 02] January 2016. 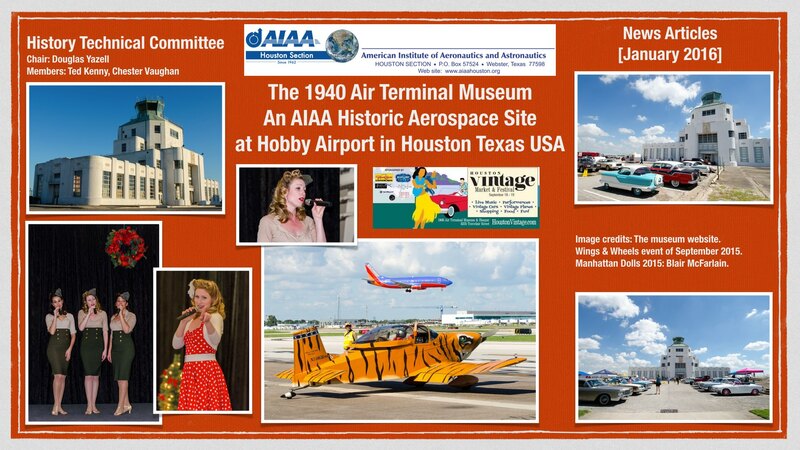 The 1940 Air Terminal Museum at Hobby Airport, Houston Texas USA. An AIAA Historic Aerospace Site. This web page’s monthly news article about this museum. [2016 01 02] Published January 2, 2016. 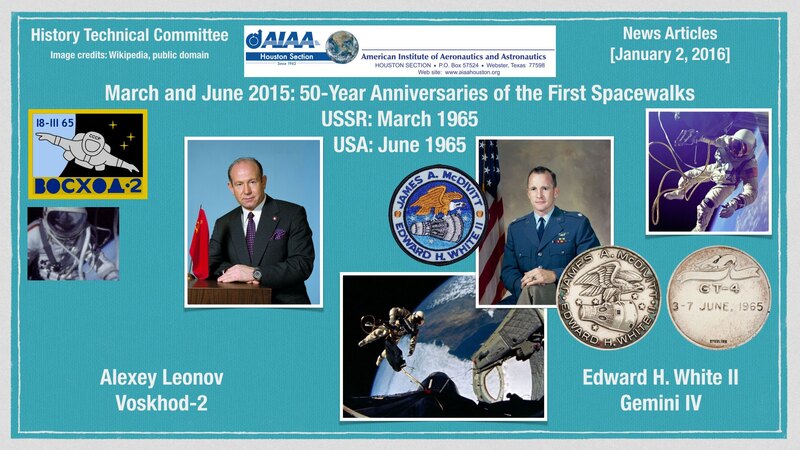 Above: March and June 2015: The 50-Year Anniversaries of the First Spacewalks. (Click to zoom.) Image credits: Wikipedia (public domain). [2015 12 16] December 16, 2015. 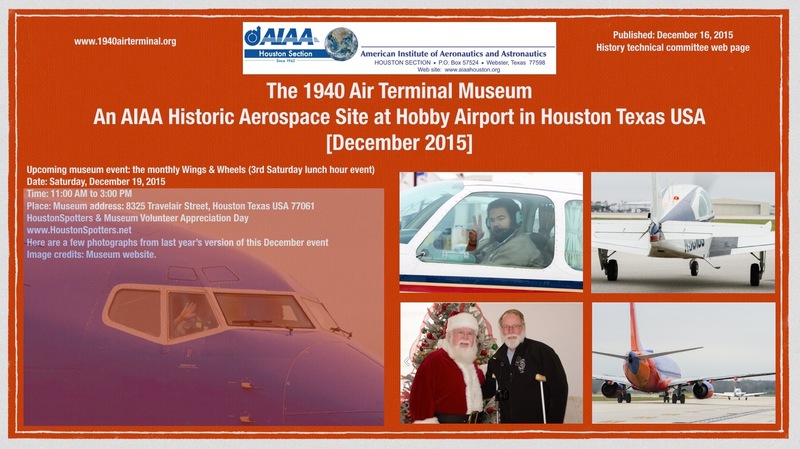 Upcoming monthly event (Saturday, December 19, 2015) at the 1940 Air Terminal Museum at Hobby Airport, an AIAA Historic Aerospace Site. Above: An upcoming event at the museum. Image credits: the museum website. Above: Gemini 7/6 Remembered. (Click to zoom.) Wikipedia article links: Gemini 7 and Gemini 6. Image credit: Douglas Yazell (iPhone 5). 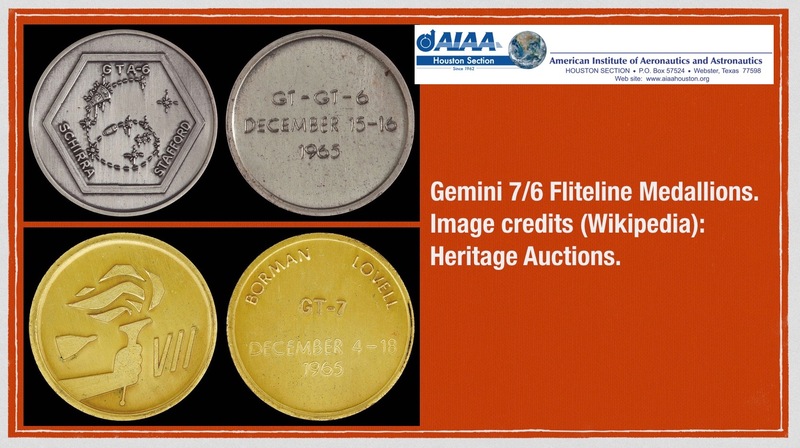 Above: Gemini 6 and 7 Fliteline medallions. (Click to zoom.) Image credits (Wikipedia): Heritage Auctions, Dallas Texas USA. Above: (Click to zoom.) Image credits: See below (NASA, the state of Texas, etc.). The bottom left image above is the Hal Beck group. 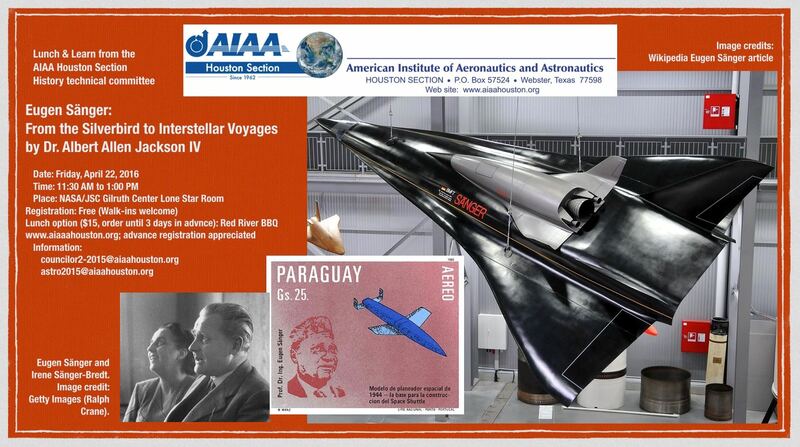 See the back cover of the May 2011 issue of Horizons, newsletter of AIAA Houston Section. One of two archives can be found here using this link for www.aiaahouston.org/newsletter. That issue is sometimes called our March / April 2011 issue. 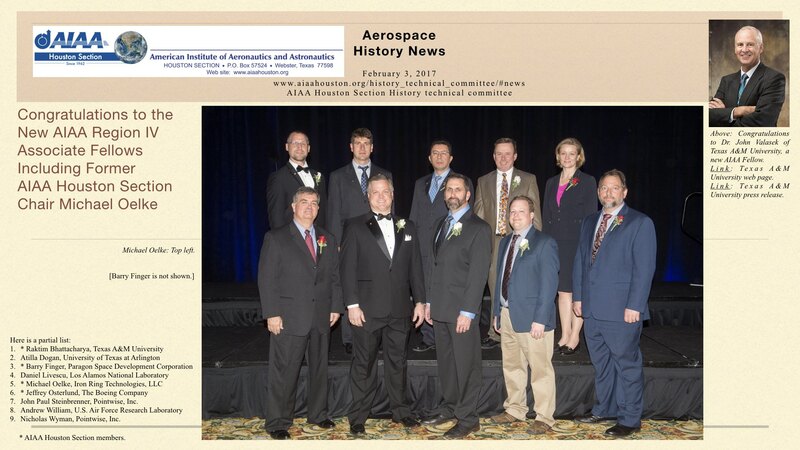 The image was published in the NASA JSC Roundup newsletter, but our AIAA caption might have a more complete list of the names of those people. The upper right image is from a Texas state government FTP website, so to speak. A link is provided here. That is Robert Rowe Gilruth with 6 of the 7 Mercury astronauts. Michael Oelke provided the other photo this week. A friend of his visited this place recently. The statue on the right is a statue of Yuri Gagarin, the first person in space. A tribute to John Glenn appears in the left side of that photo. [2015 11 21] November 21, 2015. Mark Boslough, PhD, in the recent issue of The Flight Plan, the newsletter of AIAA Albuquerque Section. See the November 2012 climate change TEDxABQ talk (Mankind can Bet on Global Warming, and Win) by Dr. Mark Boslough using this link. Above: (Click to zoom.) Dr. Mark Boslough in The Flight Plan, newsletter of AIAA Albuquerque Section, edited by Sally Smith. Above: An excerpt from a slide presented by Dr. McCarl. He stated (paraphrased, not an exact quote) that we will work to maintain our standard of living while raising the standard of living of countries with high levels of poverty and extreme poverty, and at the same time, all nations will work to respect new limits on greenhouse gas emissions, new limits representing radical and urgent change in our use of fossil fuels. (Click to see the full slide, and the link to the full presentation is above.) Image credit: Dr. Bruce A. McCarl. Above: Climate science instruments on the International Space Station. (Click to zoom.) Image credits: Climate Central and NASA. Douglas Yazell, event organizer, Councilor 2015-2017, AIAA Houston Section. Introductory charts (14 slides, 2.3 MB, PDF). Flooding Houston,Texas flood video 26.05.2015, and we can search for the URL using that title. Slides above from Douglas Yazell show scenes like this (Texas flooding of May 27, 2015). 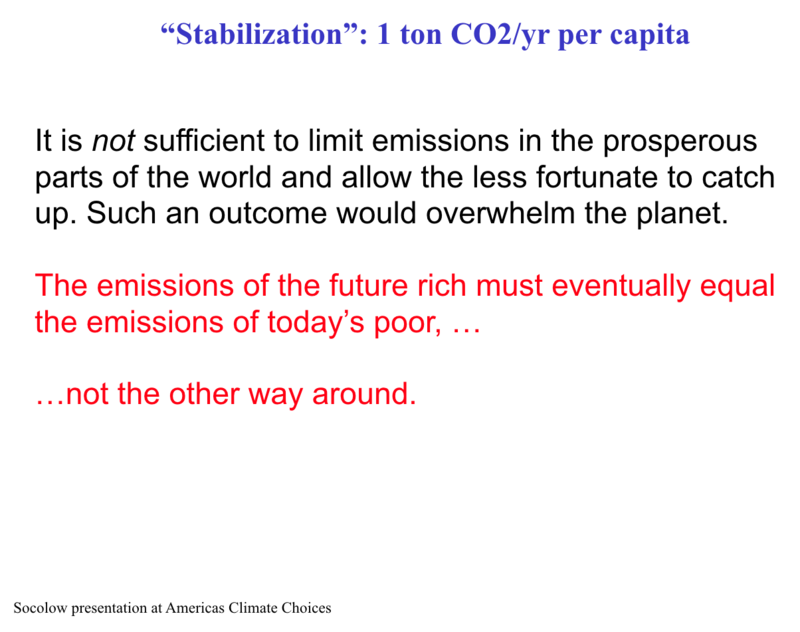 See charts from Dr. McCarl (above) to know if he made a connection between the climate crisis and those slides from Douglas Yazell. We sent those charts to Dr. McCarl before our dinner meeting of November 3, 2015. 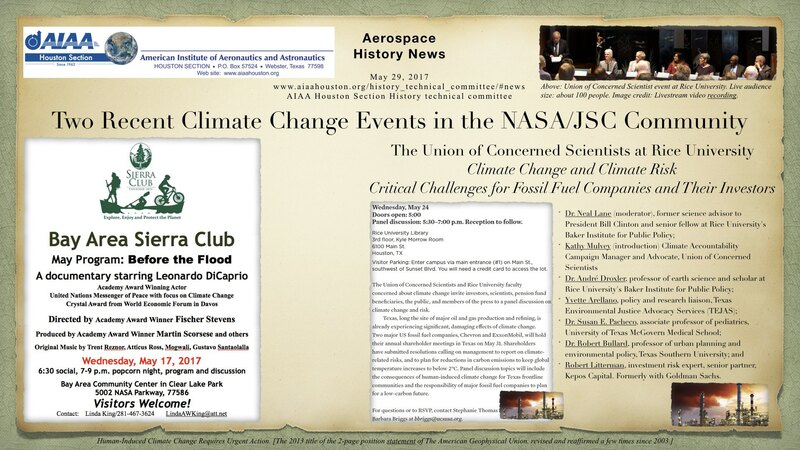 Above: Climate change engineering, science & public policy dinner meeting event photos; a quick look from November 3, 2015. (Click to zoom.) Image credits: Jesi Hoolihan. 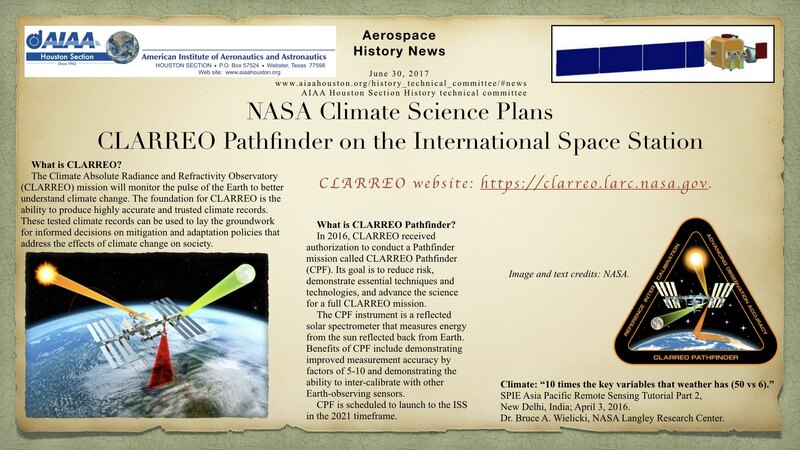 Draft newsletter article (incomplete, revision 4) about this dinner meeting event of November 3, 2015: Climate Change Engineering, Science & Public Policy. (PDF, 3 MB). 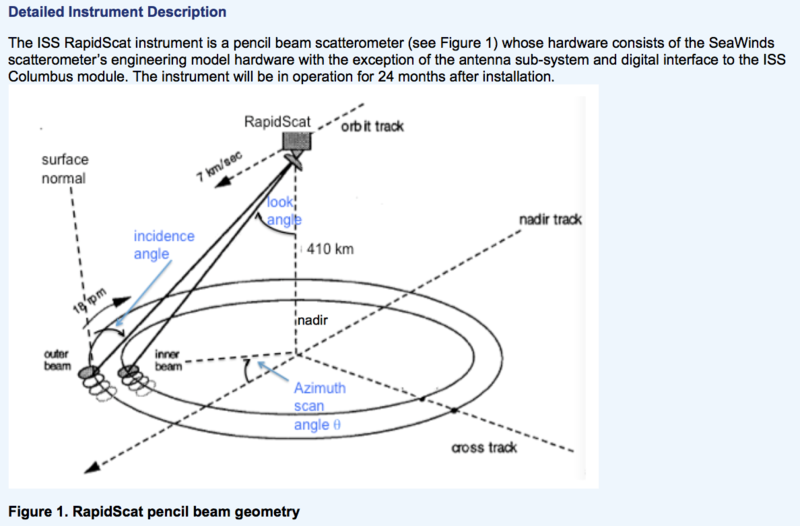 Just in time to publish with the dinner meeting presentation above from Mr. Ian Mills, today we find a NASA/JPL California Institute of Technology press release, NASA’s RapidScat Celebrates One-Year Anniversary. 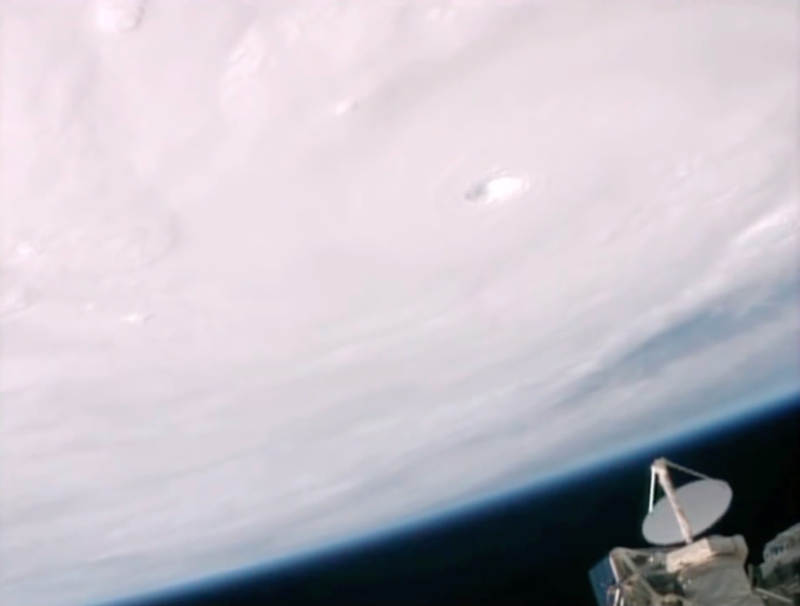 Above: Photograph of RapidScat on the International Space Station while Hurricane Patricia was at maximum strength. Cropped screen capture image from the press release. (See the press release for the video, which shows that antenna rotating rapidly. Click to see the full image.) Image credit: NASA. Above: Cropped screen capture image from a NASA Rapidscat figure. Web page found from the NASA press release. (Click to see the full figure.) Image credit: NASA. Delegation member Tuyen Hua rescanned 376 of his photographs from this 1992 visit to China. He then Photoshopped the images to sharper and larger resolutions. Here is the link to his Flickr album which he made available for anyone to enjoy, view, download, etc. [2015 11 08] November 8, 2015: A project for our technical committee: polish that plaque? 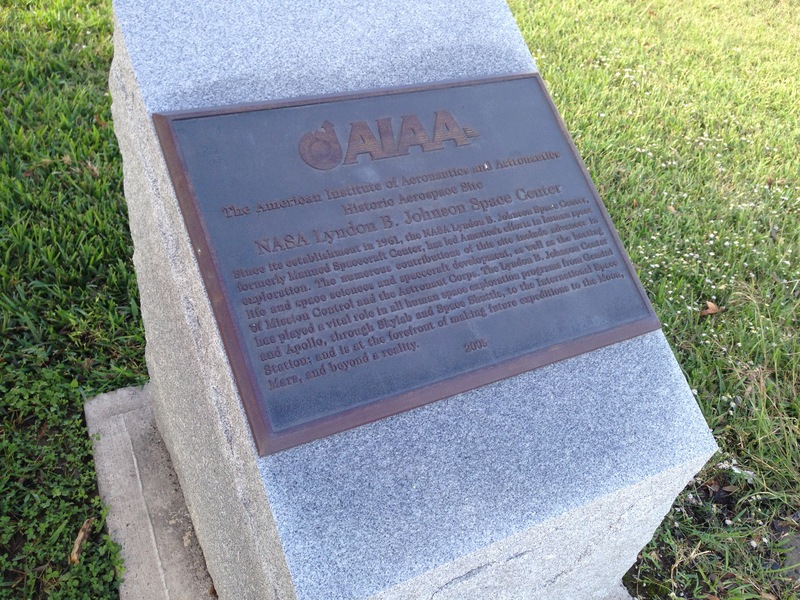 Plaque: AIAA Historic Aerospace Site Johnson Space Center 2005, outdoors in Rocket Park. That is from November 2015. 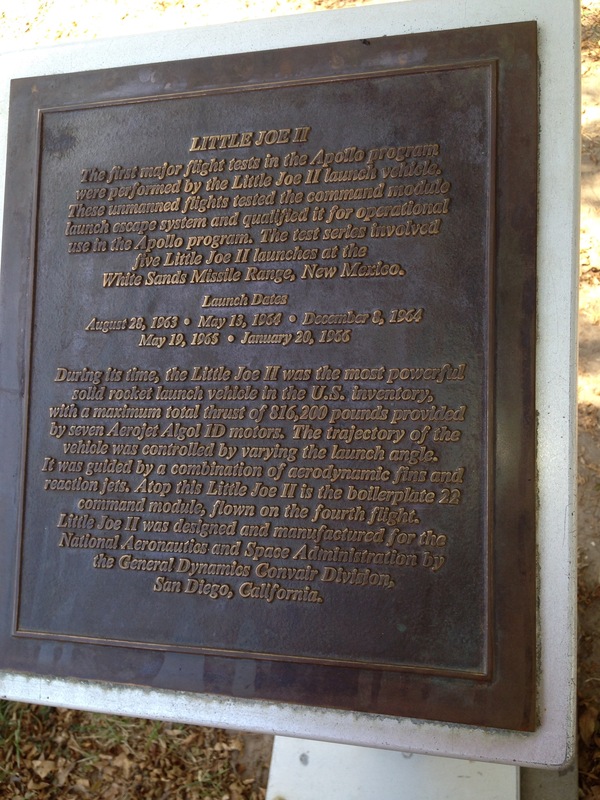 Here is a link to an image showing that plaque when it was new! 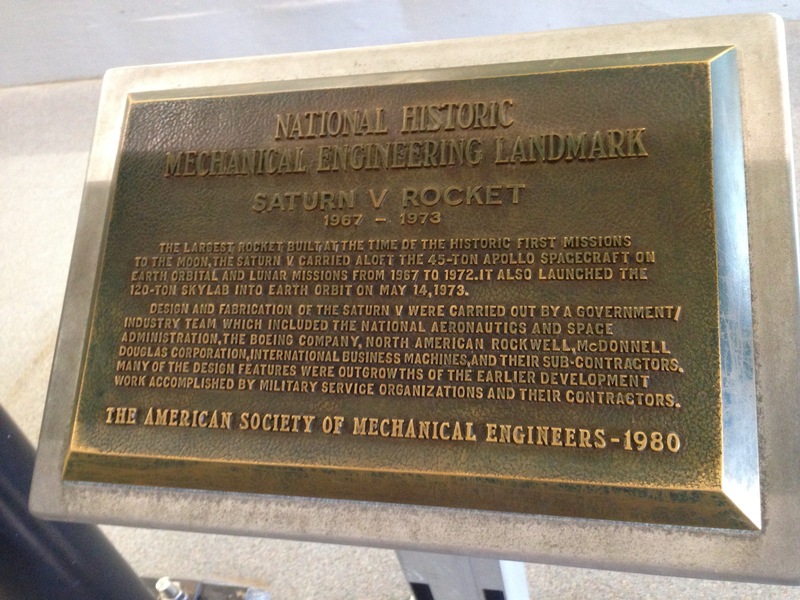 Plaque: ASME (American Society of Mechanical Engineers) indoors in Rocket Park (under the Saturn V crew vehicle, or capsule). 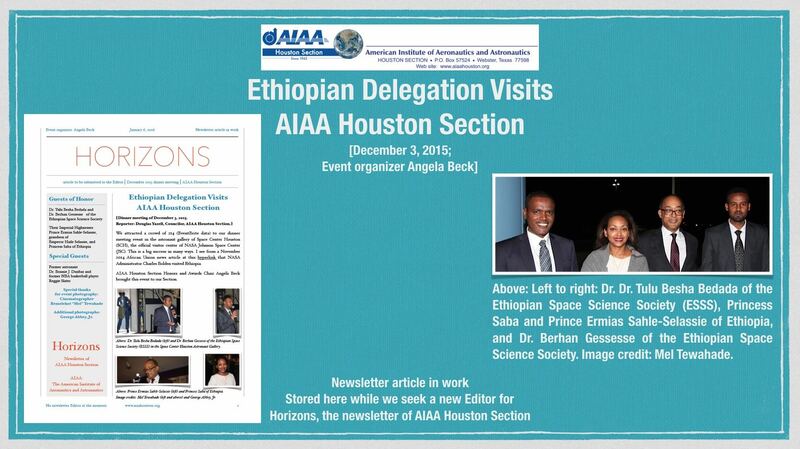 See www.aiaahouston.org for details about this upcoming meeting, featuring the Ethiopian Space Science Society (ESSS). Note: Chester A. Vaughan, retired from Boeing and NASA/JSC, was Chair of this history technical committee a few years ago, prior to Ted Kenny. We are always looking for new professional members. See the organization chart for contact information. Additional contact information is douglas [dot] yazell [at] me [dot] com. Ted Kenny initiated this audiobook project. Good progress has been made as of August 7, 2013, but an entire single chapter has not yet been recorded. Among other examples of progress, he set up a sound recording studio and two people worked on sample readings with help from documented instructions and advice. A few readers are lined up already: the author Henry C. Dethloff, Ted Kenny, Norman Chaffee (NASA, retired), Ellen Gillespie (formerly with United Space Alliance), Dr. Steven E. Everett (The Boeing Company), and Douglas Yazell. We are rounding up readers and proofers as of August 2013, and we restarted the audiobook project as of August 2015. Henry C. Dethloff is the author of quite a few excellent books. His vita is presented here. A PDF version of the book is available here from a NASA website: Suddenly Tomorrow Came… A History of the Johnson Space Center. 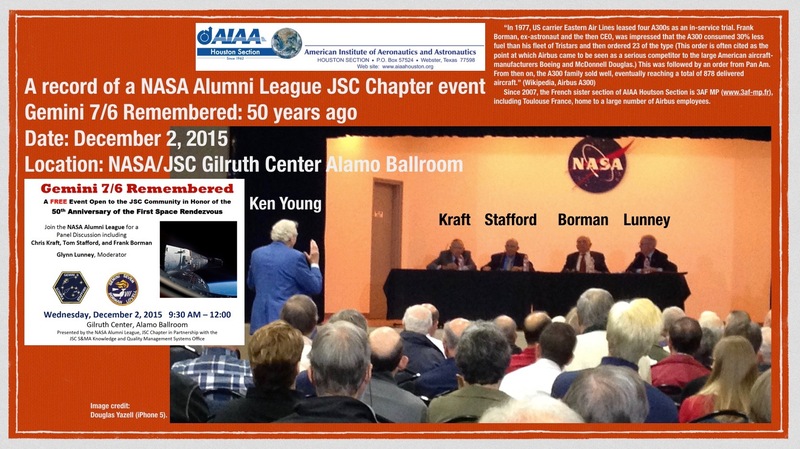 Norman Chaffee of the NASA Alumni League (NAL) JSC Chapter (NAL JSC) asked Ted Kenny for help with the NAL JSC oral history project, since Ted Kenny had an audio recording studio set up in his office area at NASA/JSC. Ted Kenny said yes. Douglas Yazell suggested an oral history for Dr. Albert Allen Jackson IV, also. Al Jackson has been the AIAA Houston Section astrodynamics technical committee Chair since 2007 or even long before 2007. Douglas Yazell will just use his smartphone to record the conversations about Al Jackson’s career, then transcribe those recordings. Only Word and PDF documents will be kept. They can be stored on this web page. A few notes about Al Jackson’s career are noted here. He was a NASA/JSC civil servant for almost five years, including Apollo 11-13. He led the team working on the backup lunar module simulator. He left NASA to earn his PhD in physics at the University of Texas in Austin. He dabbled in academia (University of Saint Thomas in Houston), then returned to the NASA/JSC community to work for Lockheed (later called Lockheed Martin), including work on orbital debris. He later worked for Jacobs in the JSC community. He is retired as of September 2014. He continues to publish conference papers about subjects such as detecting starships. Al Jackson wrote in Horizons (the AIAA Houston Section newsletter, starting with a first article in the April 2002 issue) about the importance of the Collier’s space series in his youth. Wernher von Braun led a team of editors, writers and artists (Chesley Bonestell, Fred Freeman, and Rolf Klep) for that 1952-1954 series of articles in the weekly magazine Collier’s. That series appeared in 8 issues of Collier’s. Al Jackson wrote about that in Horizons for the 50th anniversary of the Collier’s series. Around the time of the 60th anniversary, Al Jackson was part of our Horizons Collier’s team, and Horizons became the first to reprint the Collier’s series page by page in high resolution. We used 8 issues of Horizons. That started in the July / August 2012 issue of Horizons. Al Jackson is a Fellow of the British Interplanetary Society, an AIAA Associate Fellow, and a Visiting Scientist at the Lunar and Planetary Institute. Al Jackson recently nominated the late Frederick Ira Ordway to be an AIAA Fellow, and (before Ordway died) the nomination succeeded. Mr. Ordway was the science and technical adviser for the movie 2001: A Space Odyssey. The primary web site for the AIAA Houston Section Horizons newsletter as of July 1, 2012, is http://www.aiaahouston.org/newsletter/. We aim to keep ten years of an archive here. Since the newsletter started (called “Newsletter” before it was called “Horizons”) in 1971, we are building a full archive on the national AIAA Sharepoint website as we find the old issues and convert them to PDF files. 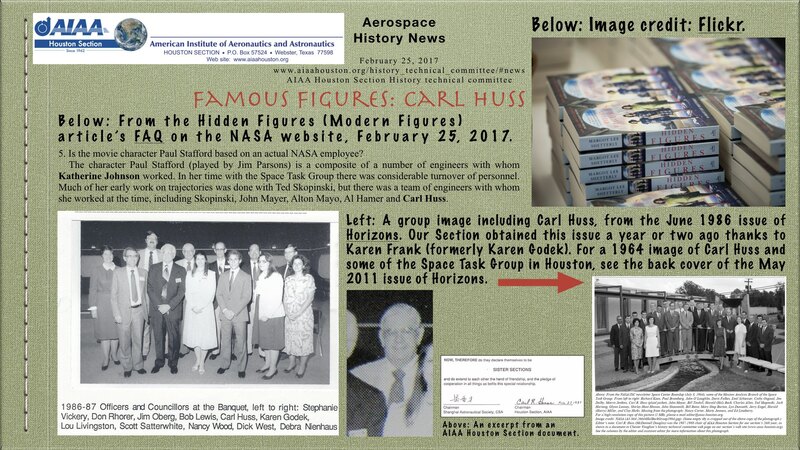 Document the history of AIAA Houston Section, which started in 1962 as the Institute of Aeronautical Sciences (IAS) Houston Section. AIAA did not exist until 1963, but claims 1931 as its initial year, since AIAA was formed by joining IAS (created in 1932) with The American Rocket Society (ARS), which started in 1930 as The American Interplanetary Society (AIS). 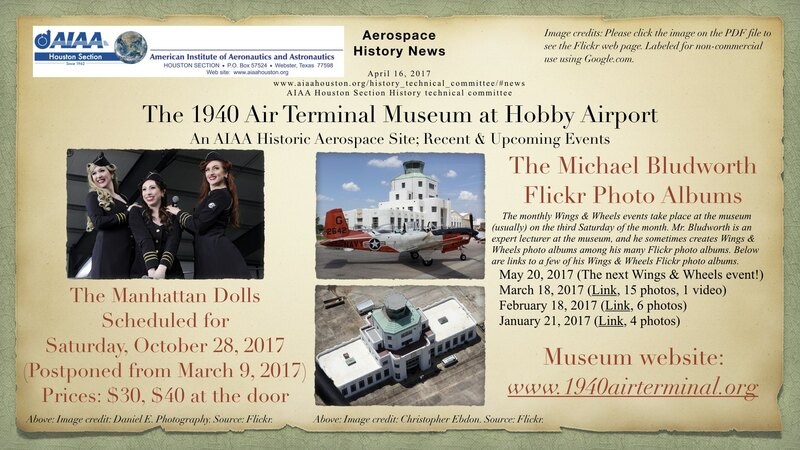 AIAA splits the difference between 1930 and 1932 to celebrate 1931 as its starting year. Scan historic section documents and make them available on this web page. Invite speakers with expertise in our profession for occasional lunch-and-learns and dinner meetings. Support our section’s Annual Technical Symposium in May of each year. Celebrate the history of our profession: aeronautics and astronautics. Conduct one to four lunch-and-learns per year. Meet in person three to four times per year. 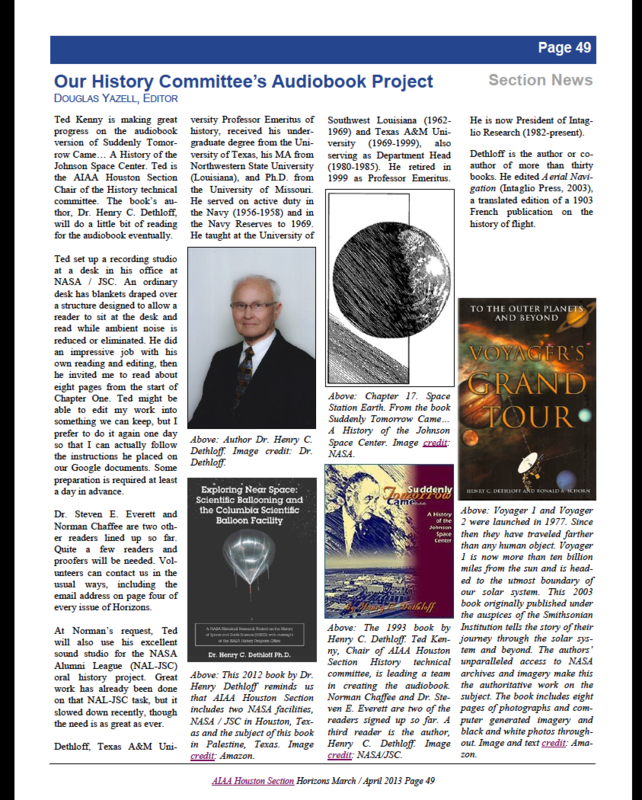 Keep in touch with and support the national AIAA History technical committee. Contribute to historical documentation of the history of NASA/JSC. 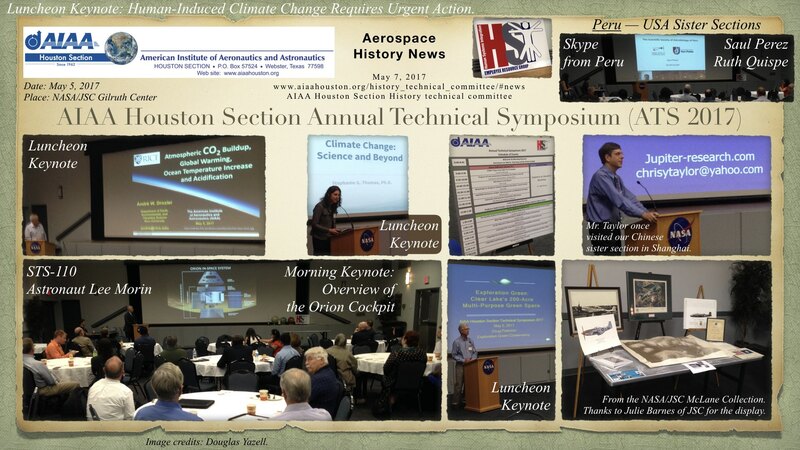 Contribute articles to Horizons, newsletter of AIAA Houston Section. 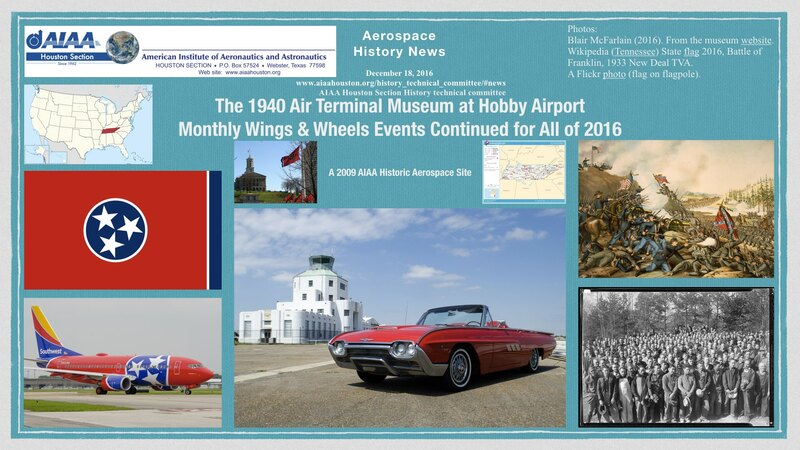 The 1940 Air Terminal Building at Hobby Airport was selected as a national AIAA Historic Aerospace Site in Janaury 2008, thanks to work by the museum volunteers and members of AIAA Houston Section. Drew Coats at the museum suggested this status to Douglas Yazell, and Douglas Yazell wrote the nominating report with help from Chester Vaughan and the excellent museum web site. Emily Springer traveled to Houston for a ceremony at the museum to award a large, bronze plaque. 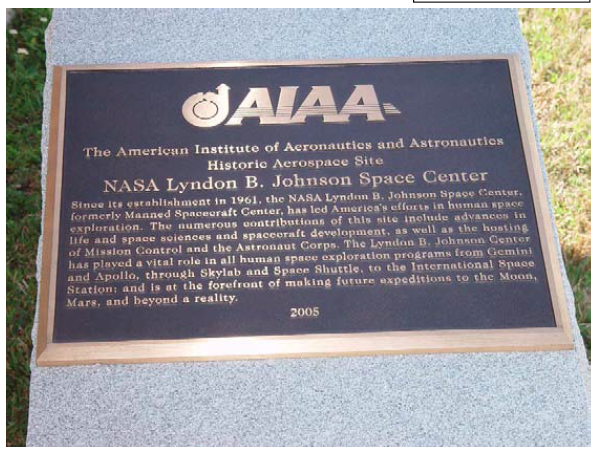 A similar AIAA Historic Aerospace Site plaque is on display honoring NASA Johnson Space Center (2005) in the same way. That plaque is on a granite base donated by NASA. It stands outdoors between the Saturn V building and the main gate. AIAA Houston Section officers since our first year (1962-1963). Updated 2017 06 17. Excel. PDF. Numbers. Organization Chart for 2016 – 2017. Downloaded June 17, 2017. PDF. On June 8, 2016, I (Douglas Yazell) noticed that www.jsc.nasa.gov/aiaa is archived at archive.org. I found Horizons issues (www.aiaahouston.org/newsletter) from 1998, 1999, and 2000. Some of those were not yet archived at www.aiaahouston.org/newsletter. I am starting that process now, and I will do that for the SharePoint archive web page (AIAA), too. Some of those issues at archive.org are HTML only, and others are both HTML and PDF. 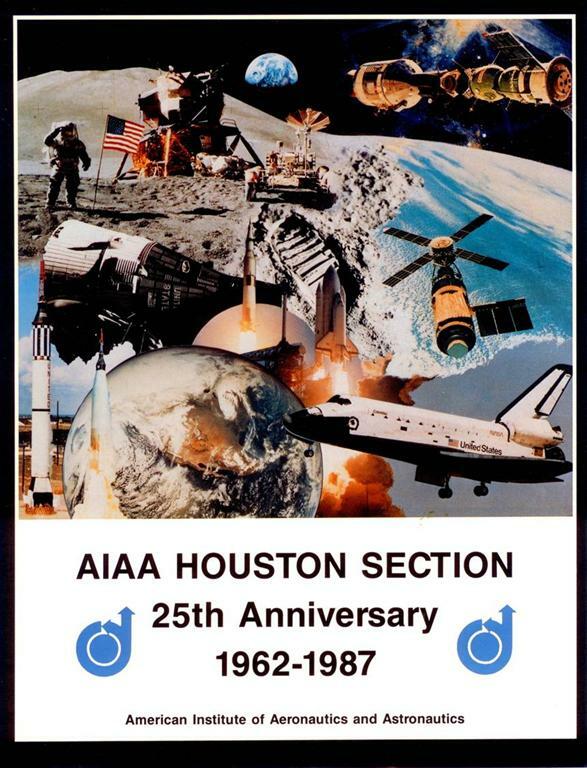 New issues for our AIAA Houston Section archive are 1999 01 (HTML), 1999 06 (HTML), 1999 09 (HTML and PDF), 1999 10 (HTML and PDF), 2000 01 (HTML), 2000 03 (HTML and PDF), and 2000 05 and 06 (HTML and PDF). When we have both HTML and PDF, we prefer the PDF, but both have advantages. Note that 1999 06 contains a report of the International Space Station Service Vehicles Conference, a successful event created by our Section. It also contains a nice news story from the Los Angeles Times about Apollo 8. Frank Borman told President Nixon’s office that they had better prepare a speech in case the two Apollo 11 astronauts died on the Moon. William Safire prepared the never-used speech, and the entire text of that speech is published here.